The Prime Minister was accompanied by Uttar Pradesh Chief Minister Yogi Adityanath and Governor Ram Naik, who helped him serve the children. 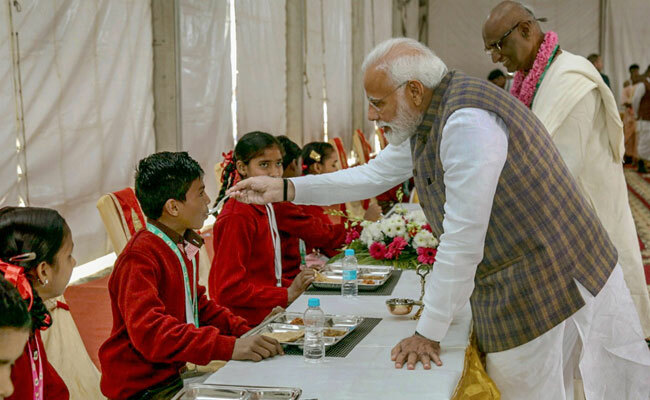 Prime Minister Narendra Modi on Monday served food to underprivileged children at a function in Mathura's Vrindavan. The Prime Minister was accompanied by Uttar Pradesh Chief Minister Yogi Adityanath and Governor Ram Naik, who helped him serve the children. The function was organised by a Bengaluru-based not-for-profit organisation, Akshsya Patra, that works with the government on mid-day meal schemes. Funded by International Society for Krishna Consciousness (ISKCON), Akshsya Patra has a state-of-the-art kitchen in Vrindavan. PM Modi later tweeted a video on his account, in which he is seen serving food to children along with Yogi Adityanath. PM Modi served the NGO's 3rd billionth meal. He also unveiled a ceremonial plaque to mark the serving at Vrindavan Chandrodaya Mandir campus in the holy city. The Prime Minister addressed a gathering later, in which he lauded the organisation for its efforts to provide food to the underprivileged children. 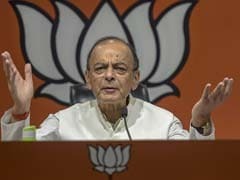 "Everyone involved in Akshay Patra, ranging from cooks to servers, are helping the country," he said. "If we succeed in delivering the nutrition campaign to every mother, every child, many lives will be saved," he added. In its 19-year journey, Akshaya Patra foundation has served mid-day meals to 1.76 million children in twelve states covering 14,702 schools. In 2016, Akshaya Patra commemorated the serving of 2 billion cumulative meals in the presence of the then President of India, Pranab Mukherjee.